Clinton In Myanmar, U.S. Deeply Realistic About State Of Reforms There : The Two-Way American officials are encouraged by recent signs of reform in the country also known as Burma, but want to see if they're real and if they last. Hillary Rodham Clinton has arrived in Myanmar for the first visit in more than 50 years by a U.S. secretary of state to the country also known as Burma — an isolated nation known for its brutal military dictatorship, but where there have been recent moves that may signal its leaders are ready to pay greater respect to human rights and give people a say in how they're governed. 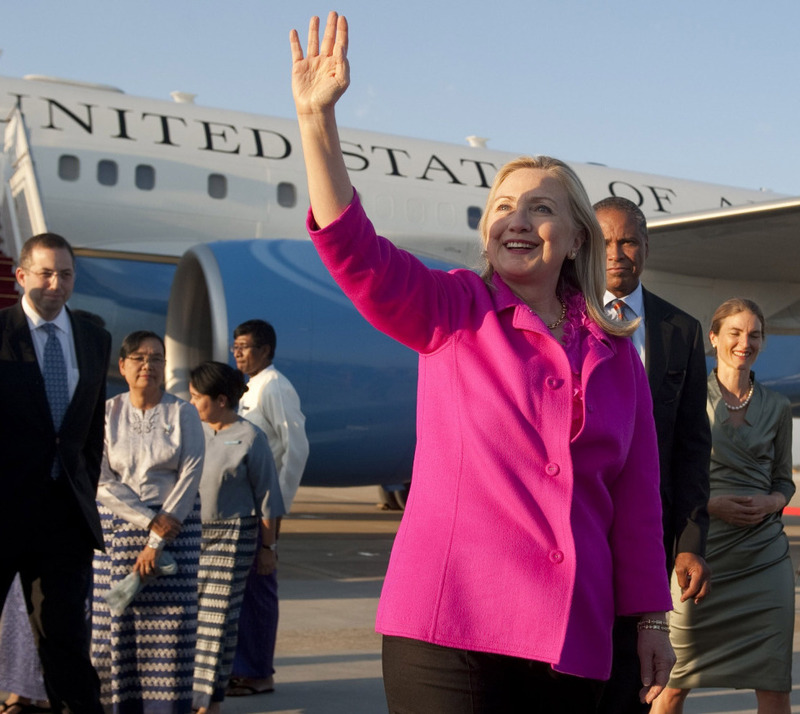 Secretary of State Hillary Rodham Clinton upon her arrival in Naypyidaw, Myanmar, earlier today (Nov. 30, 2011). NPR's Michele Kelemen, who is among the journalists covering Clinton's trip, says U.S. officials appear to be "deeply realistic" about the recent, surprising signs of reform in Myanmar. Those include the easing of some restrictions on the media and changes in elections laws that convinced Nobel Peace Prize laureate Aung San Suu Kyi (a democracy activist who had been under house arrest for 15 years) to take part in upcoming elections. Clinton, according to Michele, wants to show support for those changes while still making clear that the world is watching to see if they last. The secretary and Suu Kyi will have a private dinner, Michele says. As for why Myanmar's new president, Thein Sein, has been pushing reforms, Michele says U.S. officials believe it might be because he once was the country's prime minister — a position that let him travel and see "how far behind this country is" compared to the rest of the world and led him to decide it was time for Myanmar to stop being "an international outcast."